This month's challenge was crostata (tarts) we had a choice of two types of dough made with eggs (the first was a simple sweet crust pastry and the second used a mixture of almond meal, and barley flour with normal wheat flour). I used the first recipe for all my final dishes. Our host for this month is Simona from briciole. Simona this month, invited us to make crostata (tart), an Italian dessert. 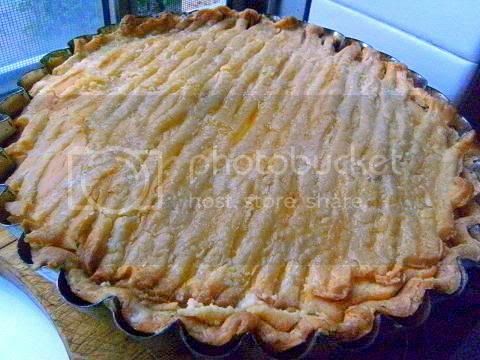 The base of a crostata is pasta frolla (or pastafrolla), sweet short crust pastry (or sweet tart dough) made of flour, sugar, butter and eggs. 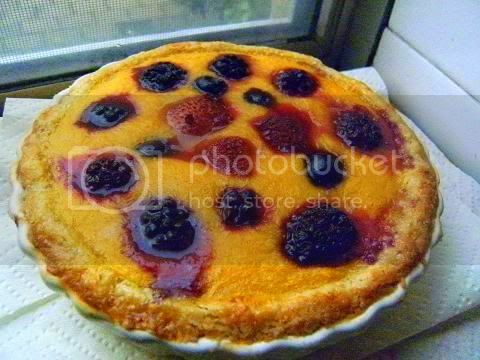 Pasta frolla is versatile: it provides the base to make crostata with fruit preserves, pastry cream, fresh fruit, ricotta, and other ingredients, and, by itself, it makes very nice cookies. 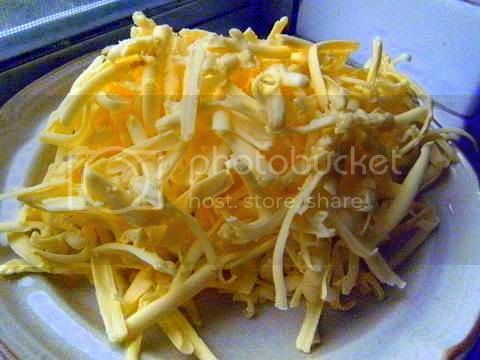 There are many recipes for pasta frolla and different ideas about how to make it. I will give you two versions that I have been using for some time. They have been inspired by those in the book La scienza in cucina e l’arte di mangiare bene by Pellegrino Artusi (1820-1911). The book was first published in 1891, and is available in English translation as Science in the Kitchen and the Art of Eating Well (further details are given in the Additional Information section). See here for the full details of the challenge recipes. This is my first crostata I used the version 1 pasta frolla recipe! I decided to do a mango and blueberry crostata since mangoes have just come into season here in Australia they are very cheap ($1 each) and super tasty. Since the pastry uses a lot of sugar (7 tablespoons) I used unsweetened puréed mangoes (with some cornflour to thicken it and a small amount of baking powder to lift it during baking) for the filling and some blueberry purée to line the base of the crostata also I used some frozen berries for decoration. The final colour of the crostata was vibrant and using pure fruit and berry purées gave the right amount of sweetness. 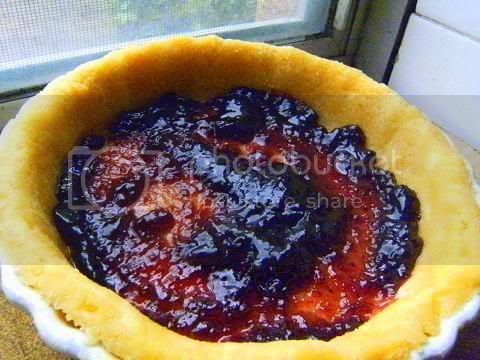 This is a simple challenge which produces a delicious tart. The mangoes and blueberries were a great combination I thought so yuumy. 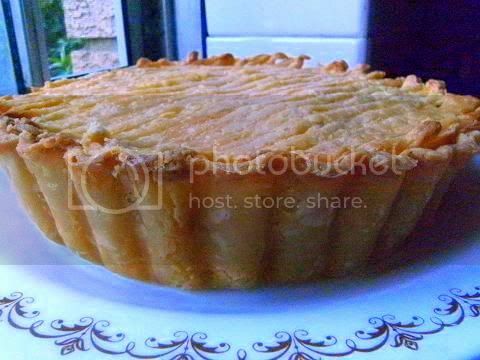 The pastry was very sweet flaky and light with a strong buttery taste this is a good tart recipe. The biggest tips I can give you is to grate the butter and freeze it. 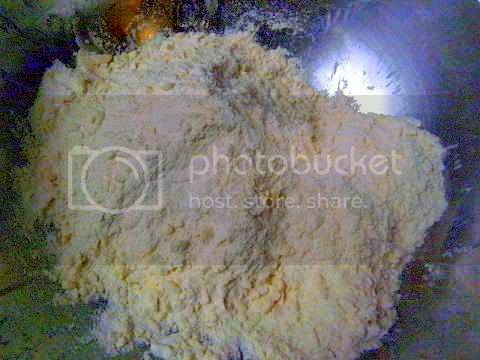 Then chill the flour, sugar and salt before rubbing in the frozen grated butter. 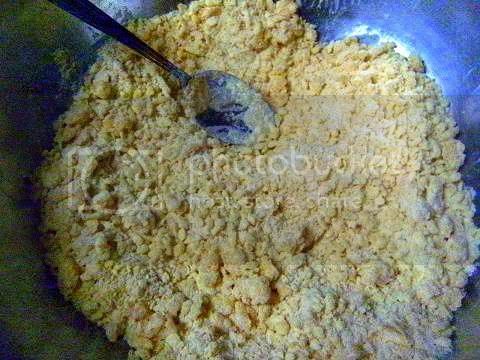 This gives you the maximum time to coat each butter particle with flour and makes the process so much easier. 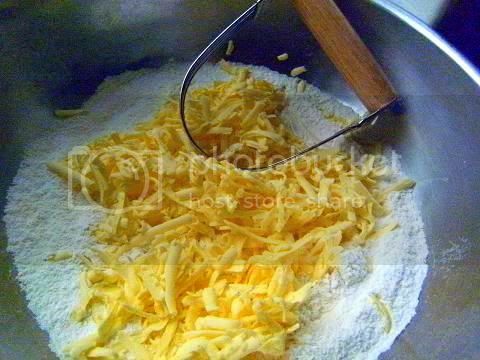 1. keep everything as cold as possible – I place the mixing bowl, the sifted flour/sugar/salt, grated cold butter, whole egg and egg yolk for 15 minutes in the freezer to get all ingredients the same cold temperature. 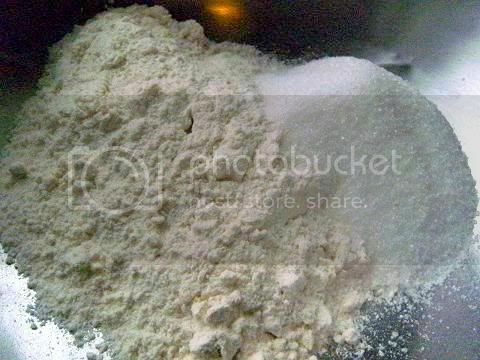 Sift together flour, sugar and salt and place into the freezer (15 mins) make sure you sift from a height this allows air to be incorporated into the mixture and trapped air is what makes pastry light. 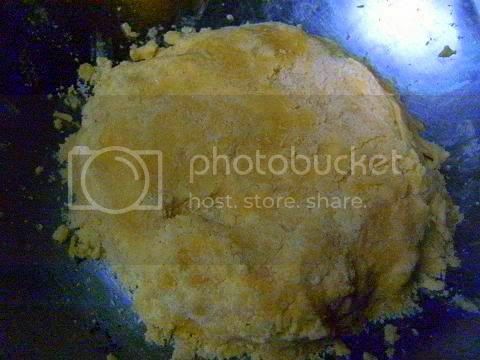 Using your fingertips only (I used a pastry blender (or you can use a fork with a knife) for most of the process only using my fingertips near the end), and working very quickly, rub the fat into the flour until the mixture resembles pea-sized lumps. 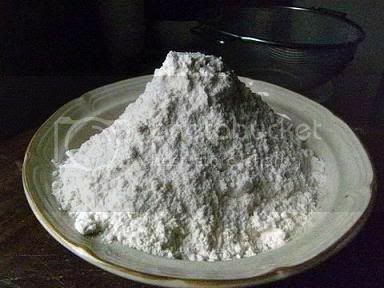 As you lightly rub the fat into the flour, lift it up high and let it fall back down into the bowl, which again means that air is being incorporated all the time, and air is what makes pastry light, make sure all the flour is coated with fat. Set aside in the fridge. I have two pictures so you can see exactly what it looks like. 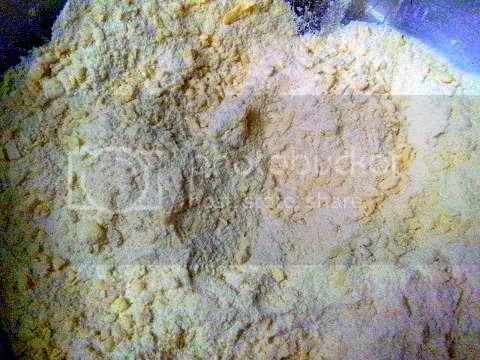 You want small pieces of butter coated with flour showing. Do not keep cutting and tossing the butter so that the butter chunks all become pea sized. 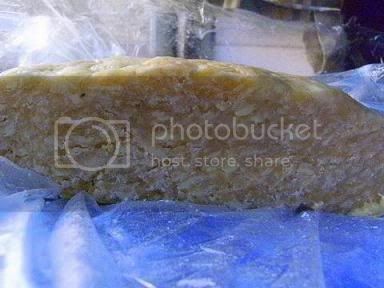 The butter chunks should mostly remain a bit larger than peas and vary in size, ranging from lima bean size to pea size. 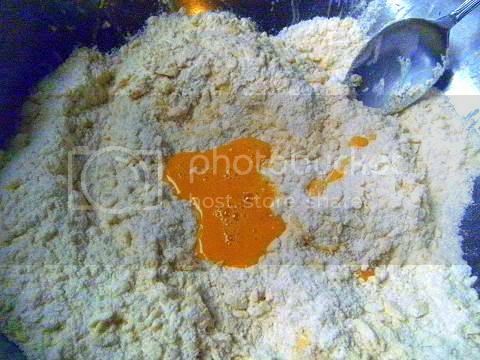 This is where most people go wrong and 'rub' the butter too long until it starts to melt into the flour – the idea is to have separate particles of butter coating the flour this produces the flakiest pastry. 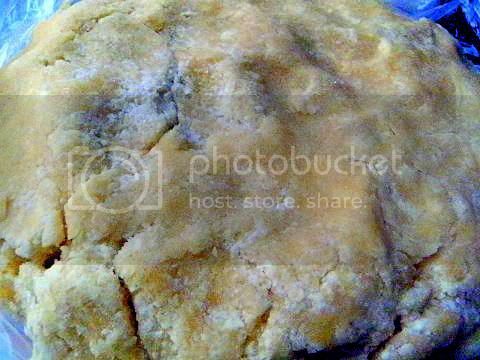 How can you tell if you are doing right – smell your fingers if they smell of butter you have melted the butter into the flour and not rubbed it in – this was the “test” that I had to pass by the person who taught me to make pastry I had to make pastry and not have buttery fingers. Try it. Keep mixing while dribbling in the beaten eggs, only adding enough to form a cohesive and slightly sticky dough. The water in the eggs allows for gluten formation (the strengthening of flour protein once a liquid is added and incorporated), which does not mean the dough will be tough or chewy, but it does enhance the flaky air pockets and the slight crunch in the mouth. This is the other place where most people go wrong adding too much liquid – the dough only needs to JUST stick together resting and rolling will do the rest. Notice how 'dry' it looks but this will produce the lightest crispest and flakiest pastry!!! 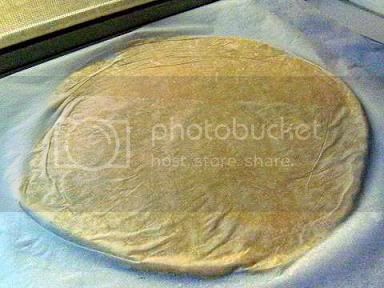 Form using your fingertips the dough into a large flat disc, wrap in cling wrap and refrigerate. 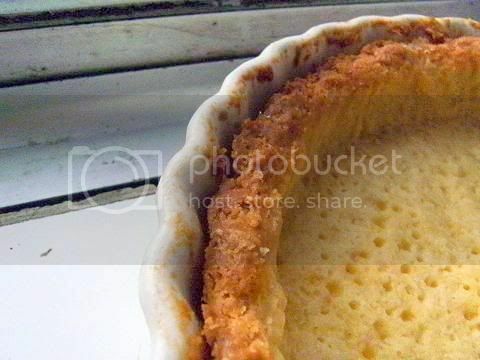 Below is a picture of the formed disk of pastry (just enough liquid to hold most of the ball together is exactly right don't worry about a couple of cracks) before chilling. The dough was still cold so I only chilled it for 30 minutes. The chilled pastry ready for use. 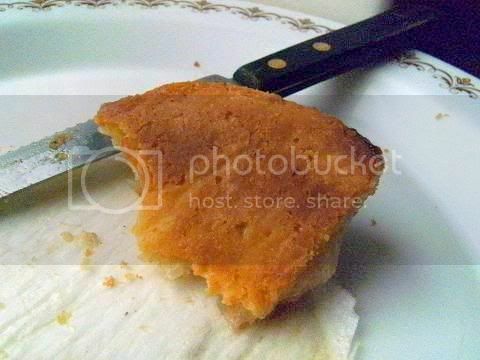 Notice how the butter is not distributed evenly in the pastry this is what you want. Looks like I haven't added enough liquid doesn't it!? The cracks don't matter the dough will come together when you roll it out. The finished crust should be chilled (at least 30 minutes) before it goes into the oven. 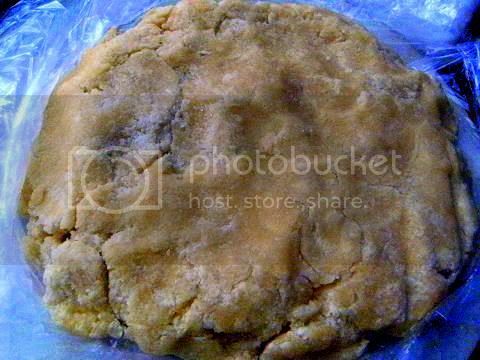 As this type of crust bakes, the flour and water layers set or gel, trapping the fat in sealed pockets. Steam develops in these sealed cells and they expand, creating an aerated pocket and a flaky texture in the finished crust. 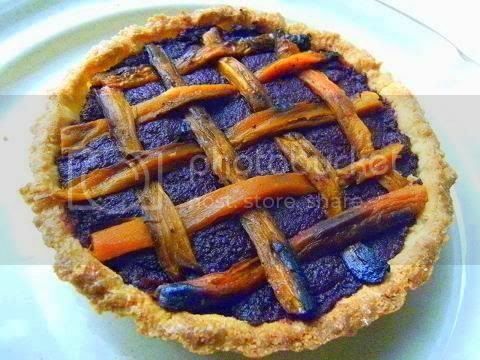 WOW this was one of the best tart's I have ever made, I love beetroot and chilli chocolate cake and I adore charred carrot and chocolate cake so I thought that I would make a crostata combining both of these roasted vegetables with chocolate and chilli. I blind baked the crostata crust then I made a roasted beetroot purée with added sugar, cocoa powder, grated 85% cocoa chocolate and chilli powder. 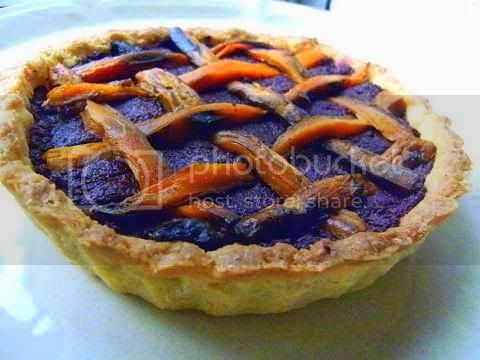 And then I roasted and charred some carrots and made a lattice for the filled crostata with the charred carrots, it looked so good and tasted superb. The dough (I used powdered sugar for this tart) is so much better when left overnight it forms a marvellous short crust pastry that is a perfect foil for the chocolate beetroot chilli filling. The charred carrots and roasted beetroot adds a HUGE depth of flavour to the chocolate. 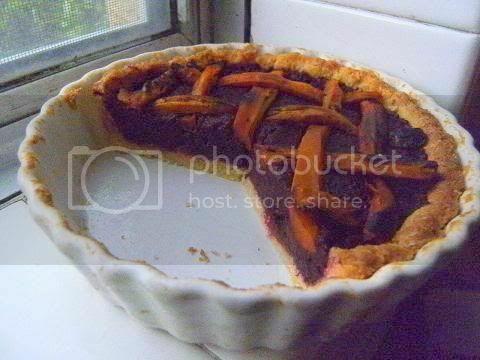 The great thing about this recipe is that the crostata crust is blind baked until totally cooked and then filled with the cold beetroot filling and the cold carrot lattice is then added perfect for a dinner party and it would make marvellous picnic food also. I'm sure it would be great warmed served with cream or ice cream. 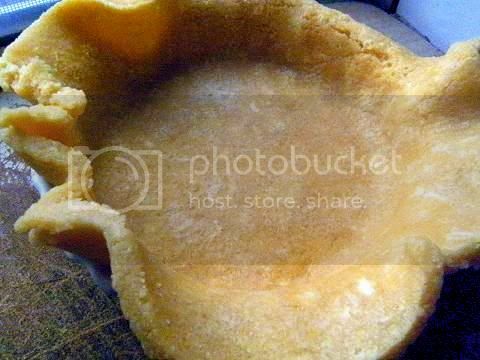 Firstly line the baking dish with the cold pastry and prick with a fork make sure that you do not go all the way through the pastry which can create holes for the filling to run out. Chill for 30 minutes before baking. 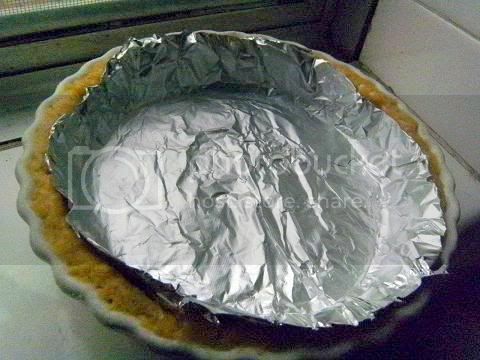 Cut aluminum foil (or parchment paper) to size do not cover the edge of the pastry if the baked crust is to be used with a cold filling, cover the edges if you are going to bake it again using a pastry lattice. Fill with uncooked rice, uncooked beans or baking balls. You can reuse the uncooked rice again and again for blind baking, do not cook the rice after you have used it for blind baking. 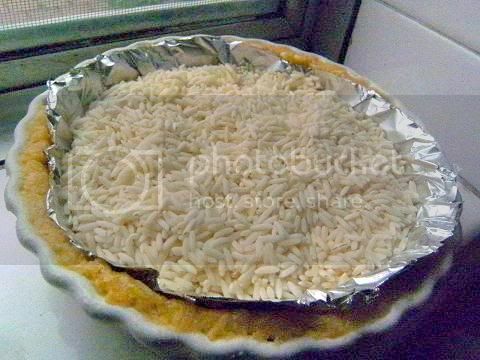 Bake for 15 minutes then remove the foil and uncooked rice. The crust will be soft and bubbly. 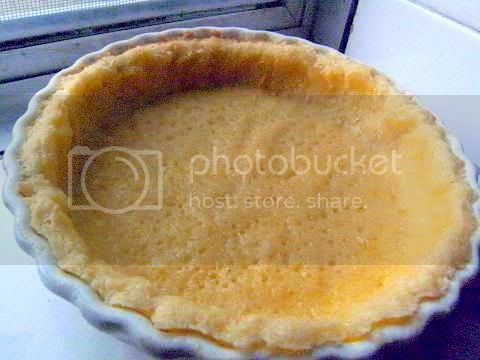 At this stage you can lightly brush the par-baked shell with some beaten egg wash which will form a layer to stop the filling from making the fully baked shell soggy. Bake uncovered for a further 10 minutes, the top edge should be brown and the bottom should be full of small and large holes produced from the expanding and escaping gases from the flour-encased-butter. 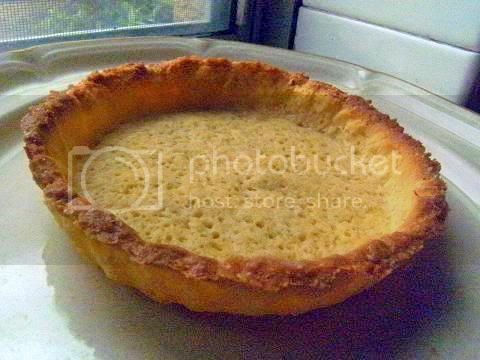 The edge of the pastry should move away from the sides of the baking dish, the pastry will be soft until it cools so be careful. 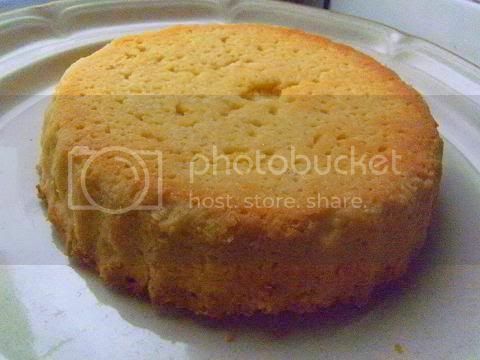 Cool until room temperature then the crust should harden and be easy to remove. 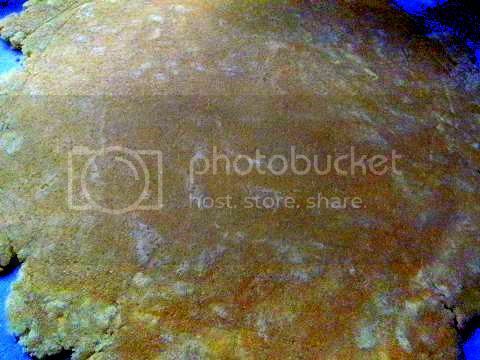 Notice especially on the upturned crust all the small and large bubbles which are caused by the expanding and escaping steam from the water in the crust. Once cooled you can coat the fully baked pastry shell with melted chocolate which will form when cooled a layer that will stop the crust becoming soggy once filled. The finished crostata notice how ”short” the pastry is in the final tart, it was so flaky and light resting overnight improves the final baked pastry a lot as compared to the two hour chilled dough. I had to do a savoury version and I thought a free-form corstata would be perfect for a filling of a tangy blue cheese (gorgonzola cheese) with roasted cauliflower purée and roasted pear. I just loved the look of this tart and it was delightful gorgonzola, cauliflower and pear go so well together I decided to do a very thin free-from crust to see how the pastry works. The pastry really is a wonder and browned and crisp up superbly. I thought I would do one more crostata before the reveal date, I decide to do a ricotta lemon and rose filling for my blind baked shell. 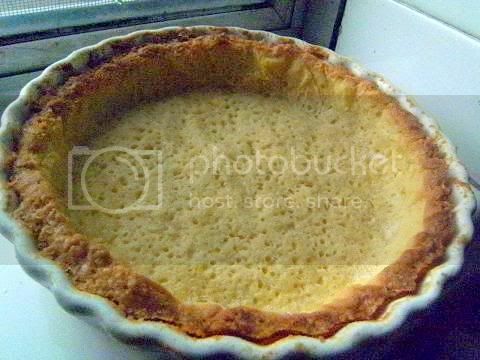 This tart is very tall over 3.5 " (9 cm) and the filling was ricotta, cream cheese, iron bark honey, lemon zest, lemon juice, 2 eggs and rose water. 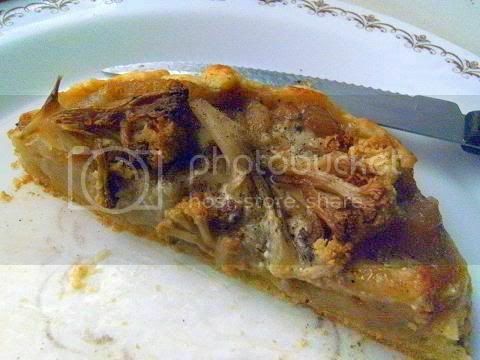 I was very pleased with the tart, the filling was the perfect balance of sweet, sour and tangy with a slight hint of rose as a faint after taste. The filling was set yet slightly soft. I loved it and well as my guests. Your crostatas look amazing! I love your flavour combination you used. I wish I had the vision to mix flavours like that. Thanks for all your support during this challenge. All your researches and tips were so helpful to everyone. All your crostatas sound delicious and I specially love your last minute ricotta lemon and rose version. Yummmmm!!! You are so creative with your flavor combinations! It is always a treat to see what you have come up with. Thank you, again, for your input and your enthusiasm on this challenge! Man, you totally take these challenges to a whole other level! Really great and creative flavors you came up with, and each crostata looks fantastic. Thanks for the inspiration! lovely crostatas.. i'm curious on how the beetroot-dark chocolate taste like.. my favourite one is the lemon ricotta and rose crostata; it looked so delicous and creamy.. i'm imagining almost like a cheesecake feel... yum! You've gone all out this time. 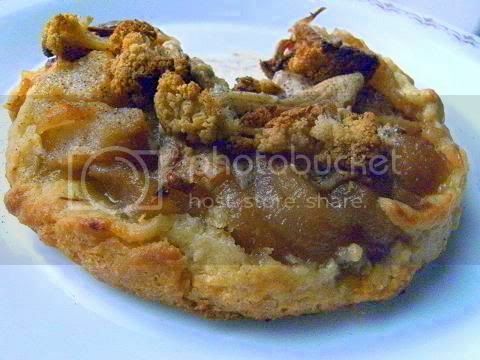 Your tarts look great and I'm glad to see that you tried the savoury and sweet combos. I would like to do this again but with a savoury idea. You always amaze me with doing to challenge in first place. I love the all combination you tried. Interesting flavor combinations! But my favorite is the first one, mangoes and blueberries delicious! 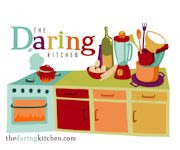 As always you have done an amazing job with the challenge, you are a true daring baker. I think if I had to choose it would be your lovely tall ricotta lemon and rose as rose is one of my favorite flavours. So many different delicious looking crostata, Audax! What a champ! Audax, first I would like to taste the Ricotta Version, please! I´m drooling. First time here..I like your space very much..I appreciate you for your wonderful presentation..Absolutely new n tempting recipes..Am following u..
How many versions?! Wow. I like the look of them all but feel especially drawn to the cauliflower one. I'll have to give that one a go. Audax...what an array. The savoury one is calling my name, the ricotta, tall and heavenly, singing to me...and the beetroot chocolate has me intrigued. Lucky guests...what a treat they must have had. Thank you from the bottom of my heart for those wonderful words...I am touched. Gracias!! Your flavour combinations are all so unique, I love the sounds of the lemon and ricotta one! And thank you for all the tips through out, definitely helped me through my first challenge. Your creativity is amazing, Audax! Love all the flavor combinations you tried. I definitely want to try the roast beet-chocolte and the lemon-rose ones -- they sound divine. Wow!!!!!! i am amazed at your continuous creations!!!!!!!!!!! All the variations look so lovely, loved the red beet colour. Such creative and delicious looking fillings! As always, it's hard to pick a favourite. Perhaps the lemon and rose? Ah, they all look so, so, so good and I love your step-by-step photos. I love all the variations! Especially the mango one. 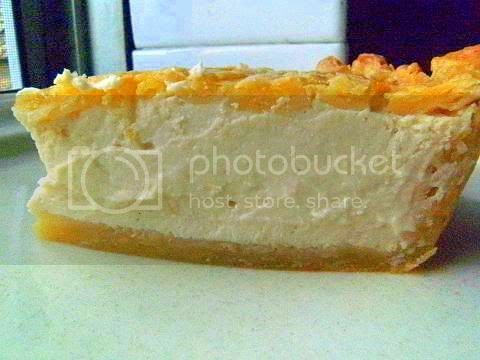 I love mango desserts. Ricotta lemon and rose sounds delightful. I never would've thought of beetroot and chocolate...so exotic. Great job! I love tat you really are "daring" and come up with amazing new ideas. I'm just sticking to tried and tested recipes at the moment but one day I might be more creative if I keep following your inspiring posts. Your are awesome everytime with stunning flavors and variations. You are real Daring Baker. Your idea to grate the butter simplifies the combining process even more, thanks for sharing. 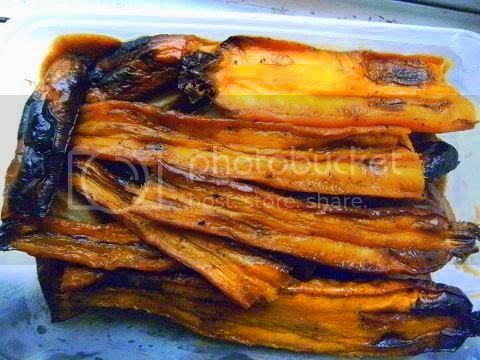 Mango is one of my favorite flavours, so I must try your recipe out! As inspiring as always! 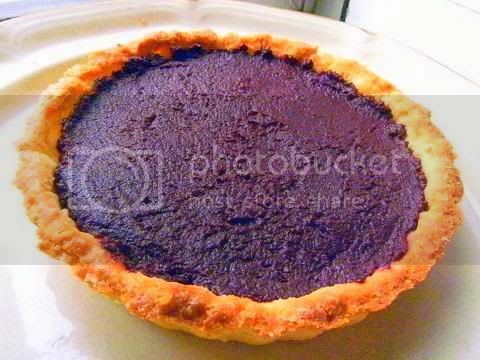 I am amazed of your very special flavors of crostatas... thumbs up! As always your results are inspirational! 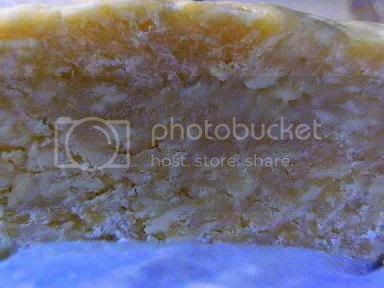 Wonderful tip with the frozen grated butter, too! So many great varieties of crostata! You must have a lot more people to feed than me! They all sound so good, but I am most intrigued by the cauliflower and gorgonzola one, as I have all the ingredients in the fridge. Outstanding job this month! The range of your fillings is quite amazing, Audax. I would not be able to choose one: they are very different from each other and all show an interesting combination of ingredients. I particularly like the idea of using roasted carrots to make the lattice. Wow, those charred carrots look so good! And I do love anything with gorgonzola in it. Your flavor choices are brilliant as always, and I love the colors of each crostata! Audax, thank you for the tips and support to everyone. Great crostate! 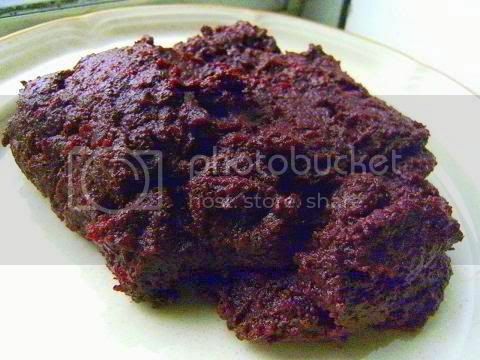 beets chocolate and chili!! what a interesting combination! I can actually imagine the flavors coming together now that you have placed them side by side in my mind! as always, fantastic creations for the challenge audax! Thanks for all the great tips, especially the one about putting fingertips in cold water before rubbing in the butter. 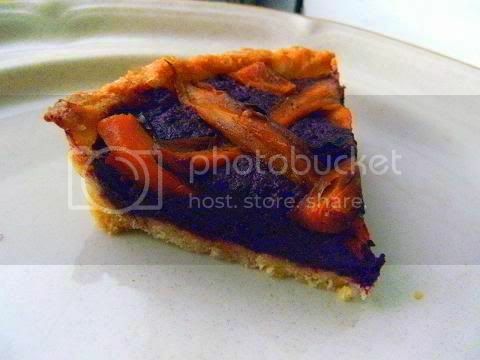 Am intrigued by the beet-chocolate-carrot crostata. Yum! hats off to you all these looks soooo delicious. Astoundingly creative and prolific, as always! Everything sounds and looks wonderful, but I just love that carrot lattice! What a great idea. This is just amazing! What wonderful tastes and colors! Breathtaking! I would have to take my time reviewing them all. Thank you for sharing these exquisite recipes! Thanks for visiting my (comparatively extremely humble!) blog. As always I am amazed by your productivity and creativity, as well as by the sheer volume of information you manage to impart! I find your tips very helpful, thanks. And that ricotta and lemon tart looks sensational! i have never made a crostata before, but i think i may have to try this. they all look so amazing. the directions make it seem easy. thx! I love your mango version. Needless to say, your crostata are droolworthy and gorgeous--each and every one! Did you make the top of the final (lemon and rosewater) crostata by laying thin strips right next to each other? Or are you withholding some very cool technique from us? I'd really like to learn how to replicate that look! I am intrigued by the beets and chocolate combination because I love chocolate and dislike beets!! Really liked the idea of combining lemon and rose in your ricotta crostata. Have to try that one. Thanks for the comment! I would literally NEVER have thought to put those things together, so I'm glad someone like you is more adventurous than me and will :) Can't wait to see what you come up with next time!! Thanks for your helpful tips! I grated and froze the butter as you suggested. All of your tarts look amazing! I'm impressed with all of the variation. I love your creativity Audax. The beetroot version sounds rally interesting, but the ricotta lemon and rose has my heart. Your variations in crostatas are amazing..lovely work! I will be working on my photography:0) and I'm very excited for the next challenge!! I am always surprised by the variety you make for each DB challenge. All of them looks so so good. All that different crostata that you made OMG, now i envy you. Wish my creativity (for coming up with all those combinations you made)was better. Can't wait till the 1st to see wat you'll be cooking up next month. Audax - Once again, your flavor pairings, and wealth of information, make for an inspiring post. Your savory crostata sounds truly amazing. Audax...you are totally unbelievable...these crostatas looks fantastic and delicious! I definitely need to try some of them. Great tip about the "buttery fingers". I've definitely overworked my pastry, thanks very much for the advice. You went all out for this one. They look so good! I love the tips on blind baking the crust as well... so helpful! Wow - three different crostatas - all with flavor combinations I wouldn't think of in a million years. Would love to try them though - they look delicious. 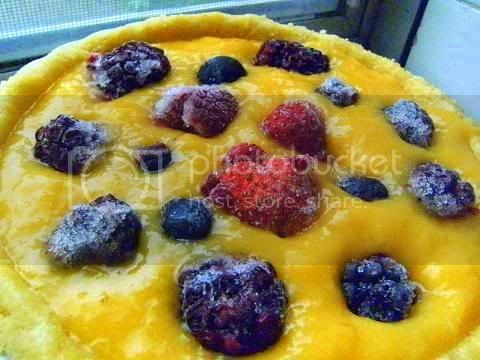 I'm loving that mango and berry crostata! It sounds so fresh and delicious. The beetroot and chocolate sounds really cool, too! Great job on this challenge! Gee wizz, so many beautiful versions of crostata, my mouth is watering! Great job, Audax, and thanks for all your help and tips on the recipes. Audax, great work as usual. Love all the filling ideas. And your step by step tips are awesome. I really like the sound of the beetroot and carrot one. Thank you for your kind comments on my crostata, I was surprised how well it turned out because I was rushing the whole way through! WOW, the ricotta lemon and rose crostata looks good. You are so creative, so many different types of crostatas. Love the colors of the mango and blackberry one. Fun challenge. Thanks for the nice compliment on my blog. Awesome, Audax! I think I'm most intrigued by your vegetable and chocolate one, but they all look amazing! Wow, these all look amazing. I'm especially intrigued by the dark chocolate, beetroot and carrot one. Aside from the crust, did you use any sugar in it? I bet it'd be great for a diabetic. Your crostatas look delicious, my goodness you gave this challenge a good go (where do you find the time!). The ricotta lemon and rose creation has YUMMM written all over it. I'm amazed at all your flavor combinations..!! wanna try the beetroot n carrot one. love what you've done with this challenge! Your crostate are fantastic! I really love thae mango and blueberry one. All are very original. Another wonderful challenge. Your crostatas look wonderful! Great job on the challenge!! What gorgeous and creative crostatas (crostati?) you made!! And I must thank you for your extremely detailed instructions you posted on DB--I really benefitted from them! Wow you were one busy baker! What interesting combinations and such a great variety! Excellent baking!! You are so helpful! I grated the butter just like you suggested and it worked perfectly. Your crostata look so wonderful and all of your tips really make the challenges more doable. Thanks for being so thorough and always on top of things! 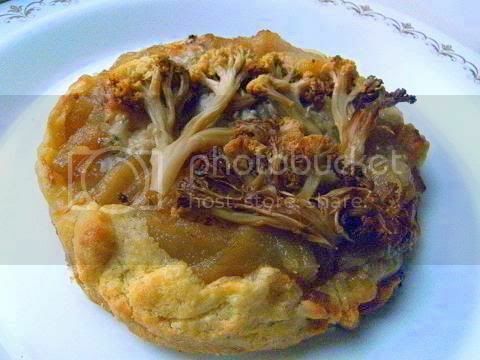 Before I saw your cauliflower crostata, I was thinking that I should have put cauliflower in mine. Great minds! Hi first time here...lovely and wonderful space with delicious recipes..all the tarts are droolworthy..please do visit me when you have a time...! I am in awe at your beautiful creations! They all sound so delicious. Thanks Audax for commenting on mine....sorry I couldn't get to yours earlier. Holy moly! Those look so creative and delicious, especially the one with pear, cauliflower, and gorgonzola! Your passion and creativity with this challenge is fantastic! I really appreciate all the tips you include. 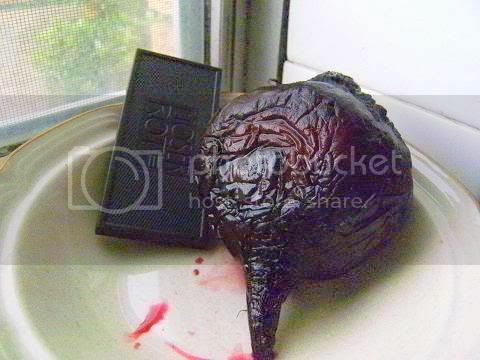 Roasted beet and chocolate, what a combination, wish I could try it! 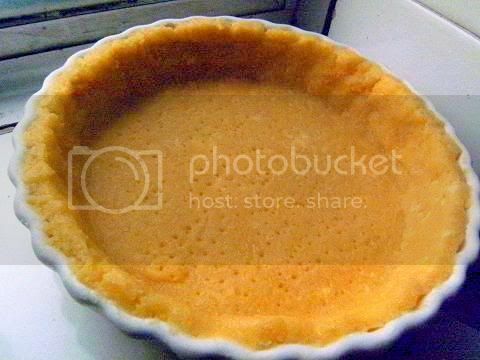 All your version of tart looks very delicious and the tart cases are simply amazing. Thank you for visiting my blog and leaving your lovely comments. Wow, Audax, each is better than the next and if you placed them all in front of me I'm not sure which I'd choose! Fantastic! But that chilli-chocolate-beet crostata is intriguing! *sigh* Your food alwys looks so edible--and I mean that in the best possible way. I want a take a bite out of everything! Holy wow! that is great baking, I am your newest follower. Thank so much for visiting my blog and your kind words about my crostat. 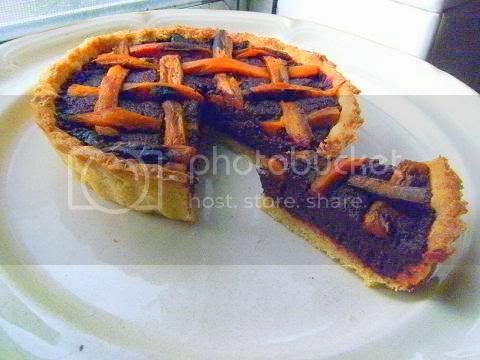 Yours are so amazing in flavour combinations and I love carrot lattice on the beet/chili chocolate crostata. Hi there! You mentioned on my blog that you'd had beetroot, chocolate and chilli ice cream - did you use your crostata mix (with similar flavours) to make it? Sounds very intriguing and I want to give it a go! is it possible for you to email me the quantities for the beetroot filling?